From the Baldwin County Courthouse, go east on Hancock St. and follow Highways 22/24 southeast for 4.4 miles to the split of Highways 22 and 24. Bear right on Highway 24 and go for another 0.9 mile to Lover's Lane. Turn left on Lovers' Lane and proceed less than 0.1 mile. The cemetery is on the left side of the road in a grove of pine trees, about 100 feet into the grove. The cemetery could be considered to be at the corner of Lover's Lane and Britney Drive. A cemetery approximately 100 by 100 feet. There are slabs and sunken places but no marked graves. Based on census and Pugh family information, this person may be buried here. d. after 1880, per census. Based on census and Pugh family information, this person may be buried here. d. after 1880 census Based on census and Pugh family information, this person may be buried here. Aged 60 years. All info from Telegraph and Messenger, Jun 17, 1883, which indicates she was to be buried in burial grounds of Mr. Thomas Pugh. 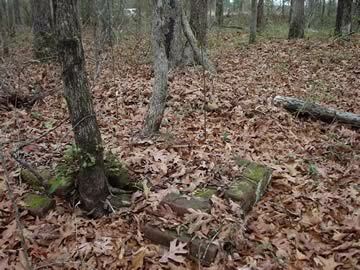 3 bricked graves, 6 slabs and other sunken graves, approx 13-15 visible graves in all.